In mid-April I had to concede defeat in my attempt to grow morel mushrooms and turned my attention to procuring dried morels instead. After a lot of price shopping I decided to try LifeGourmetShop.com and while I waited for my package to arrive, I started researching how to use dehydrated morels in place of fresh ones. The available information on rehydrating morels is generally straightforward with a few notable exceptions. Mushrooms should be placed in a liquid for around 20 minutes. What type of liquid is at the discretion of the chef, but most agree that water is just fine. Some people recommend hot water while other say that hot water will pull more of the morel flavor from the mushroom to the water. Taking the more conservative approach, I have used cold water with great effect and based on the heavy morel perfume and coloring of the cold water after a 20 minute soak, I think cold is the best approach. For the past month I have been enjoying morels that look, feel and taste *almost* like fresh morels in everything from omelets and pasta sauce to mixing them in with ground beef for hamburgers and stir fries. But what to do about all that mushroomy goodness left in the water they were soaked in? 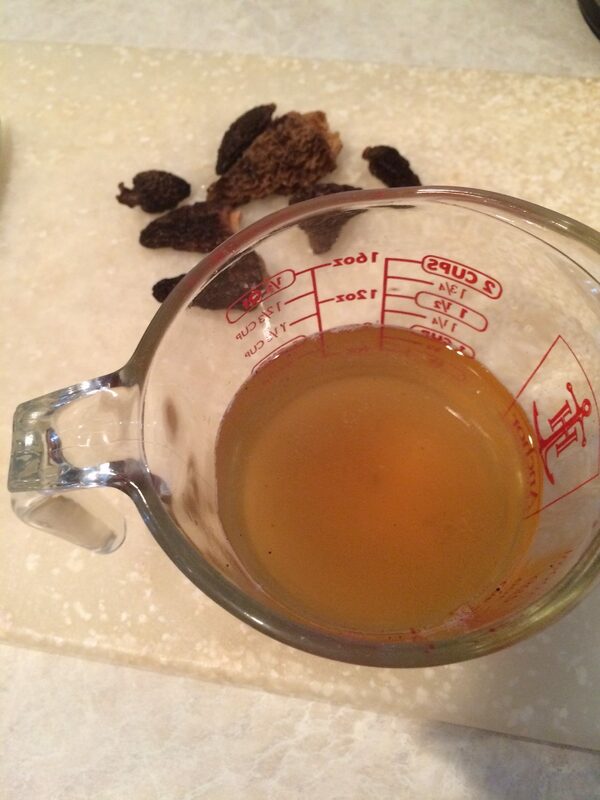 Luckily, one of the sites I searched had a great tip – filter the morel water and use it as a partial or whole replacement for water or stock in recipes that would be complimented with a bit of umami. 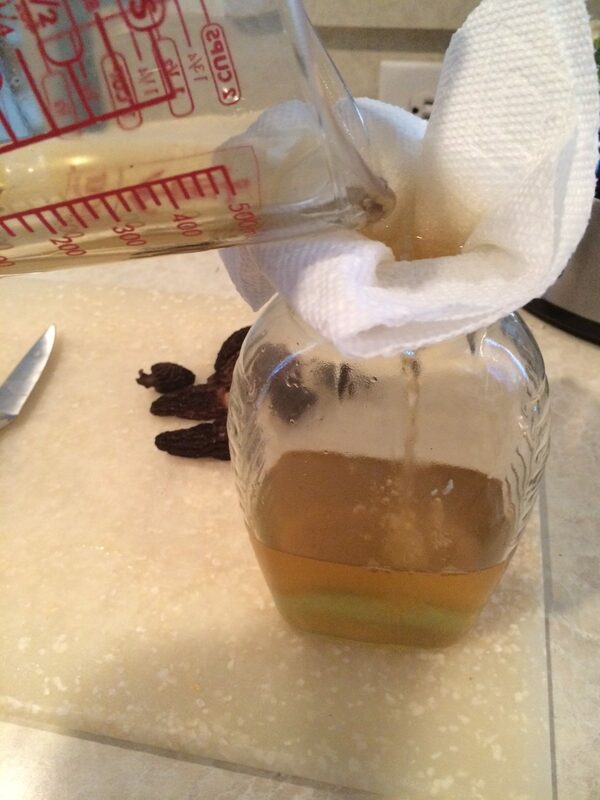 A paper towel tucked over the opening of a container makes a great strainer to remove any grit or debris that may have been tucked into the folds of the morel for fresh uses (next 2 days). Strain and pour into ice cube trays, then pop out the cubes and place in a freezer safe bag for a longer shelf life. Since learning this trick I have been using the golden liquor to replace potions of chicken, beef and vegetable stock as well as added to water for boiling pasta. It’s a great way to stretch my borrowed harvest for this year into many more dishes and over a longer period. My 6th grade Home Ec teacher would be proud! This entry was posted in Food Preparation, Morel Mushrooms, Mushrooms, Pro Tip, Thrift. Bookmark the permalink.